One of my favorite walks takes place in Northern Spain on the south flanks of the Pyrenees Mountains. This entire region warrants high placement on my “favorite things” list because of the unbeatable combination of stunning scenic beauty, charming mountains villages built of the durable and ever present Pyrenees granite, and a virtual absence of tourists! Ordesa National Park is a special gem amidst this special region! We access it from a tiny stone village named Torla that, apart from a few satellite dishes mounted precariously on slate roofs, appears to have changed little since the days of Don Quixote. The church balanced proudly on a promontory on the edge of town is a magnet for photographers, lending its dramatic profile to one’s first panoramic introduction to the massifs of Ordesa. Like most standout walks, this experience offers a mosaic of impressions and weaves together a lovely variety of light, color, shapes, and sound. Beech forests on the first part of the trail catch sunlight and convert it to iridescent green as it filters through the May spring growth. Most of the route parallels a glacially fed mountain stream that babbles over a timeless bed of granite gravel and bedrock. 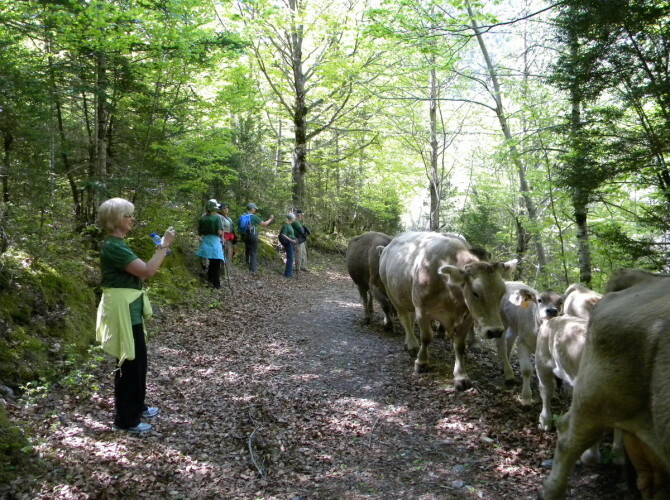 A resident herd of brown dairy cows often meander across the trail with complete indifference to our existence. But the stars of the show are always the ancient granite cliffs in almost nonstop view, towering over the valley in defiance of glaciers, the passage of time, and the wearing of elements. Barcelona has the closest international airport to Ordesa National Park (about a 4 hour drive). From Barcelona, the motorway A-2 takes you out of town westward. Your map or GPS will route you northwest towards the Pyrenees – your destination is the village of Torla. After about 200 kilometers of freeway/motorway, you’ll be on 2-lane highways though lovely pre-Pyrenees countryside. Torla is the northernmost community on highway N-260 before Ordesa National Park. It’s a delightfully tiny village with about 4 hotels, 2 small markets, a couple ATM machines, and some fun local eateries. WARNING: Everything is on Pyrenees time here – laidback and relaxed. The national park is only 8 kilometers away down the road from Torla – the road dead-ends in the national park car park where you’ll find a humble ranger station, a small gift shop, and a café. All trails start from here.